First of all, this sharks are actually blue, this is not an effect of blue water. 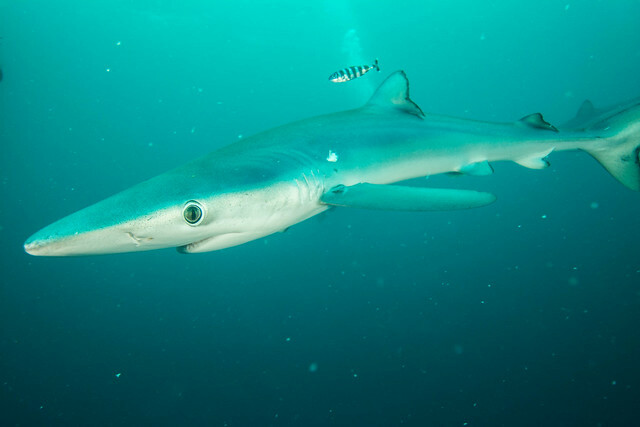 This tiny sharks are very curious, they push everything with their noses, trying to find out what is it and is it edible. Small and brisk, they try to swim through your gear hoses, under the arm, everywhere. I would say that this sharks behave pretty much like small devils. In the begging of the dive we usually had 2 sharks, to the end you can count much more. Being underwater with this sharks you are always busy with brushing them aside, and when the first shark is gone, you immediately get another one appearing somewhere over your shoulder or near your face. And all the time you need to care about taking pictures! Sometimes sharks were stuck while biting the bait rope, so our divemaster Brocq had to release them from it. We had a lot of fun with this cute creatures!